With 16 years of comedy experience on his belt Gordon Southern is one of the most sought after headline acts on the UK and international circuit. Gordon regularly plays to sell out audiences at the most prestigious clubs in the country including Comedy Store and Jongleurs. His upbeat and energetic delivery combined with his fantastically funny observational comedy and quick witted improvisation has secured his place as an audience favourite. An award winning writer with critical acclaim for numerous projects that he has worked on, Southern has written for some of the most memorable comedy shows of the last decade. Not content with mastering stand-up and writing Gordon is also a brilliant actor with praise from The British Theatre Guide for his debut acting role in Moon The Loon. His acting skills are not just confined to the stage however, he was the very memorable voice of the Admiral Insurance Parrot on their national TV and Radio ad campaigns. 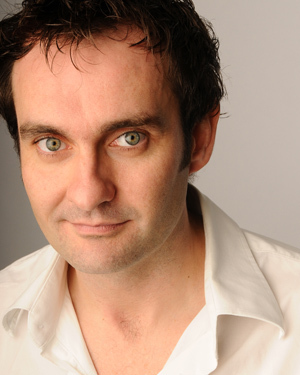 Gordon is a regular headlining comedian on UK and International circuit. He spends at least 2 months every year performing in Australia. A highly regarded international act, he’s worked in may exotic and challenging places, including Afghanistan, The Arabian Desert, Falkland Islands, Kosovo and Liverpool. Forthcoming trips include solo theatre shows in India, South Africa and Australia. Gordon made his Edinburgh debut in the highly respected Comedy Zone in 1997 and has since gone on to take up several successful and acclaimed solo shows. Other writing credits include work for shows on BBC2, C5, Sky One, BBC Radio 1,2,4,5 and stand-up material for other live acts. “Magical imagination.” Three Weeks Daily.